Here at Loadbalancer.org we’re committed to keeping enterprise print environments flowing. We work closely with all of the major print management software vendors, and because of these close relationships, we have a deep understanding of customer environments. Our approach is all about asking the right questions to get to the heart of what really matters. Find out more in our previous print blogs - Printing without pain: How to scale print environments and avoid downtime and Load balancing Microsoft Print Server. Our partners and customers know that they can ask us questions, too, and one of the most common things we’re asked about is PaperCut. PaperCut is a print management solutions provider that offers this via two applications: PaperCut NG for simple print management, and the powerful PaperCut MF for complete print, scan, copy, and fax management. PaperCut MF lets you cut costs and waste in your workplace by managing print, scan, copy, and fax. It has powerful exclusive features including Job Ticketing and Secure Print Release. PaperCut NG, meanwhile, lets you track activity and influence better printing with behavior-changing policies. More about PaperCut and their offerings can be found on their website here. How do I load balance it? Load balancing PaperCut NG or MF requires an identical setup to that which you’d use for load balancing print servers. As per our blog, you’ll still be load balancing over TCP, and you’ll still be using SMB port 445. Once you have your print servers running through the load balancer, you simply install the PaperCut Secondary Server application on those servers. What do the various PaperCut components do? This is the main application, where you can administer reports, printing costs and print quotas, as well as other print-related actions. This reports to the application server, updating user and print information that the secondary print server has handled. 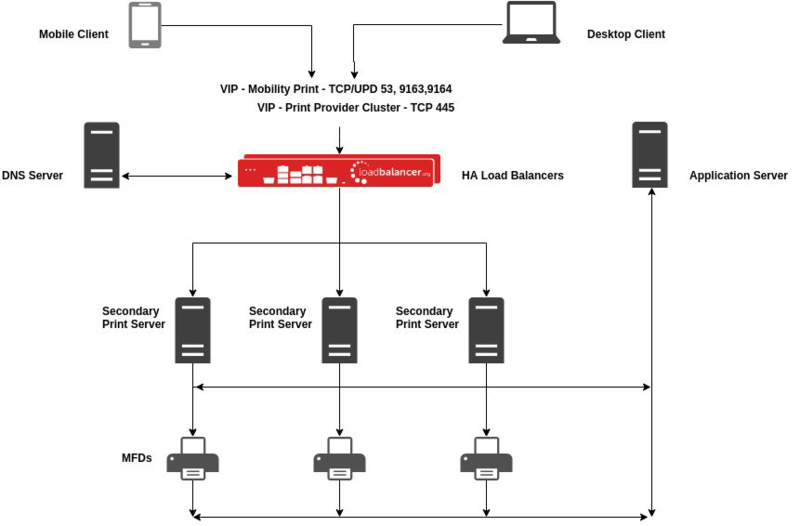 Note: Mobility Print can be installed on the secondary print servers and can be made highly available when placed behind a load balancer. Mobility Print allows users to print from their mobile devices via network print services and can be load balanced using TCP/UDP 53, 9163,9164. This component is designed to be placed on remote sites from where the application and secondary (print servers) are located. An example might be that the application server and secondary servers are installed in a head office and the site servers are installed in regional satellite offices. In the event of there being a WAN outage, as the users in the regional office will continue printing via the site server (where PaperCut replicates info from the application server), this allows them to continue to be able to print jobs, authenticate at an MFD in that office and release their jobs. In the event of an outage on the application server, the site server will take over to allow printing and reporting to continue at that site. Note: placing the application server or site server behind a network load balancer is not recommended. For details on PaperCut’s recommended deployment methods for the application and site servers, see their blog, Clustering and high availability. Placing all the secondary print servers behind a load balancer is perfectly fine, and indeed recommended as per the network diagram below. What does a load balanced PaperCut environment look like? Make way for the network diagram! In terms of load balancing the print servers, failover can occur when one of the print servers within the VIP cluster either fails health checks or is manually removed from the cluster via the sysadmin. Users' prints will continue to flow as their requests are sent to the remaining print servers within the VIP cluster. In terms of failover for the PaperCut application, here’s where things get interesting. Taking the network diagram as an example, the application server essentially administers the application. The secondary print server (Print Provider and Mobility Print) sends all its data to the primary print server. Finally, the site print server does the same as the secondary server and sends its data to the application server. However, when the application server fails, the site server then takes its place and acts as the application server for the site it’s based in, until the link to the application server is back online. What happens to the prints at the site where the application server fails? The secondary servers will action the requests they receive based on the offline policies that are set within the application server. Do not allow new print jobs to print but hold and wait for reconnection. Using a Loadbalancer.org appliance ensures high availability of your print servers, whatever gets thrown at them. Because we take the time to develop a thorough understanding of our customers’ needs - and because of our extensive experience in the world of print - we’re able to create less complex, easier to support solutions.